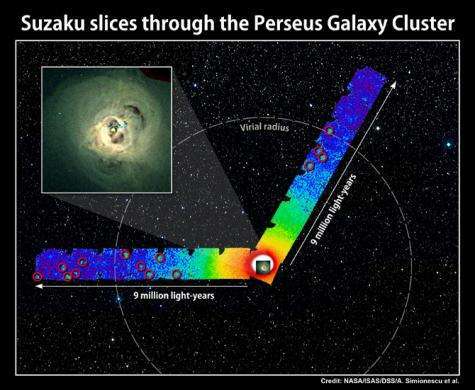 Suzaku explored faint X-ray emission of hot gas across two swaths of the Perseus Galaxy Cluster. The images, which record X-rays with energies between 700 and 7,000 electron volts in a combined exposure of three days, are shown in two false-color strips. Bluer colors indicate less intense X-ray emission. The dashed circle is 11.6 million light-years across and marks the so-called virial radius, where cold gas is now entering the cluster. Red circles indicate X-ray sources not associated with the cluster. Inset: An image of the cluster's bright central region taken by NASA's Chandra X-ray Observatory is shown to scale. Credit: NASA/ISAS/DSS/A. Simionescu et al. ; inset: NASA/CXC/A. Fabian et al. 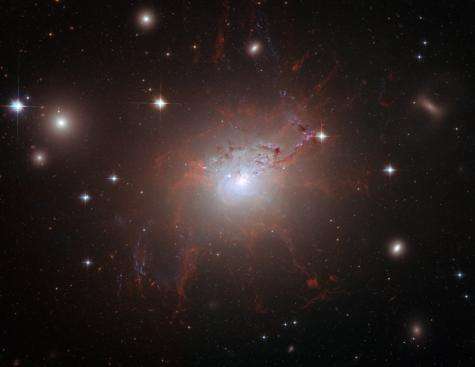 (PhysOrg.com) -- X-ray observations made by the Suzaku observatory provide the clearest picture to date of the size, mass and chemical content of a nearby cluster of galaxies. The study also provides the first direct evidence that million-degree gas clouds are tightly gathered in the cluster's outskirts. Galaxy clusters are millions of light-years across, and most of their normal matter comes in the form of hot X-ray-emitting gas that fills the space between the galaxies. "Understanding the content of normal matter in galaxy clusters is a key element for using these objects to study the evolution of the universe," explained Adam Mantz, a co-author of the paper at NASA's Goddard Space Flight Center in Greenbelt, Md. Clusters provide independent checks on cosmological values established by other means, such as galaxy surveys, exploding stars and the cosmic microwave background, which is the remnant glow of the Big Bang. The cluster data and the other values didn't agree. NASA's Wilkinson Microwave Anisotropy Probe (WMAP) explored the cosmic microwave background and established that baryons -- what physicists call normal matter -- make up only about 4.6 percent of the universe. Yet previous studies showed that galaxy clusters seemed to hold even fewer baryons than this amount. Suzaku images of faint gas at the fringes of a nearby galaxy cluster have allowed astronomers to resolve this discrepancy for the first time. The satellite's ideal target for this study was the Perseus Galaxy Cluster, which is located about 250 million light-years away and named for the constellation in which it resides. It is the brightest extended X-ray source beyond our own galaxy, and also the brightest and closest cluster in which Suzaku has attempted to map outlying gas. "Before Suzaku, our knowledge of the properties of this gas was limited to the innermost parts of clusters, where the X-ray emission is brightest, but this left a huge volume essentially unexplored," said Aurora Simionescu, the study's lead researcher at the Kavli Institute for Particle Astrophysics and Cosmology (KIPAC) at Stanford University. In late 2009, Suzaku's X-ray telescopes repeatedly observed the cluster by progressively imaging areas farther east and northwest of the center. Each set of images probed sky regions two degrees across -- equivalent to four times the apparent width of the full moon or about 9 million light-years at the cluster's distance. Staring at the cluster for about three days, the satellite mapped X-rays with energies hundreds of times greater than that of visible light. From the data, researchers measured the density and temperature of the faint X-ray gas, which let them infer many other important quantities. One is the so-called virial radius, which essentially marks the edge of the cluster. Based on this measurement, the cluster is 11.6 million light-years across and contains more than 660 trillion times the mass of the sun. That's nearly a thousand times the mass of our Milky Way galaxy. The researchers also determined the ratio of the cluster's gas mass to its total mass, including dark matter -- the mysterious substance that makes up about 23 percent of the universe, according to WMAP. By virtue of their enormous size, galaxy clusters should contain a representative sample of cosmic matter, with normal-to-dark-matter ratios similar to WMAP's. Yet the outer parts of the Perseus cluster seemed to contain too many baryons, the opposite of earlier studies, but still in conflict with WMAP. To solve the problem, researchers had to understand the distribution of hot gas in the cluster, the researchers say. In the central regions, the gas is repeatedly whipped up and smoothed out by passing galaxies. But computer simulations show that fresh infalling gas at the cluster edge tends to form irregular clumps. Not accounting for the clumping overestimates the density of the gas. This is what led to the apparent disagreement with the fraction of normal matter found in the cosmic microwave background. "The distribution of these clumps and the fact that they are not immediately destroyed as they enter the cluster are important clues in understanding the physical processes that take place in these previously unexplored regions," said Steve Allen at KIPAC, the principal investigator of the Suzaku observations. Goddard supplied Suzaku's X-ray telescopes and data-processing software, and it continues to operate a facility that supports U.S. astronomers who use the spacecraft. Suzaku (Japanese for "red bird of the south") is the fifth Japanese X-ray astronomy satellite. It was launched as Astro-E2 on July 10, 2005, and renamed in orbit. The observatory was developed at JAXA's Institute of Space and Astronautical Science in collaboration with NASA and other Japanese and U.S. institutions. It is unbelievable that in a paper (a scientific one) people talk about dark matter (an ad hoc assumption) as it in fact existed! DM was never measured, never recorded never inferred properly because every time one gets a better measurement and more "normal"matter is discovered less DM is left without never being detected. However, people keeps on referring to its as it did! This is how to convince people of something that does not exist but after so many papers and words a lot os people simply believe it exists. I have to agree with GuruShabu. We don't like it when the god types post about god being fact because he's just a theory that has never shown even the slightest proof of being real. if you replaced the words 'dark matter' with the word 'god' in this piece it would be no less meaningful to me. THen you too really do not understand the DM theory. DM is an answer to an equation. It may not exist but it cannot be ruled out by todays observations. We KNOW galaxies spin faster than they should given our current understanding of gravity -we also know a few other tell tale things that point to the fact that one of our theories is flawed -but we do not know which one and at which scale it no longer applies -much like classic momentum is useless at the quantum scale and QM is useless on the macroscale -one of our fundatemtal equations is either wrong or there is something out there that we cannot see. So while we continue to test our equations and they keep coming back correct on bigger and bigger scales - it points to the fact there could be something out there that we cannot detect -whether energy or matter it exists. Please stop talking about DM in scientific reports, it only exists to fill in the fact your math is incomplete. Angry Moose is on the right track... If you replace DM with God, it would make more sense. Uhhh, discussing and questioning the existence of dark matter is like questioning the existence of air on Earth. Totally understand all the resentment towards dark matter. But you also should keep in mind that most new sub atomic particles discovered were first theorized. Even in the scientific method we see hypothesis before results. All im saying is that to make an assumption that something is there when we cant prove it is simply human nature, or should i say the nature of science. I believe that we do this because time and time again hypothesis have been proven to be true, such as there being fundamental parts to an atom. At first we thought the atom was as small as it gets, then it was theorized that there are fundamental sub atomic particles that make up the atom, and that theory was proven with with tools from the LHC, Fermilab, etc. Closest the the most massive object creating gravity things should orbit faster than things farther away from that center point, yet galaxies some how maintain a constant rotation from all distances, this is why we theorize dark matter exists.